The mediaeval or medieval period, or the middle ages, covers a huge stretch of time, from A.D. 476, following the fall of the Roman Empire, to the start of the renaissance in the 14th and 15th centuries, so that’s around a thousand years. Francesco Petrarcha or Petrarch, 1304–1374, one of the creators, possibly the original creator, of the idea of an Italian renaissance, painted by Andrea del Castagno, c. 1421–1457. Some historians have taken to splitting the mediaeval period in two: the ‘dark ages’ until the 10th century (from an anglocentric view, that’s before the Norman invasion of 1066, when the language in England was Old English); and the ‘middle ages’ from the 11th century (between the Norman conquest and the renaissance, during which the language evolved into Middle English). This split is an ahistorical view which ignores how the term ‘middle ages’ was originally conceived by those who minted it. 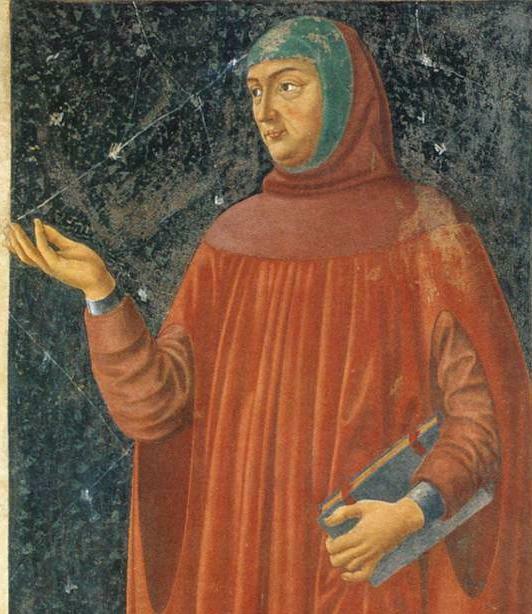 It was Italians of the 14th and 15th century, primarily Francesco Petrarca or Petrarch, Leonardo Bruni and Flavio Biondo, who defined themselves and their generation as bringing about a renaissance (rebirth) of classical Roman and Greek wisdom. Thus, for the people of the self-defined Italian renaissance who delineated the ‘middle ages’, the term meant precisely and explicitly the same as the ‘dark ages’: it was a whole millennium of cultural darkness in the middle period between the fall of the Roman Empire and Italian culture’s rediscovery of its treasures. The idea of this alleged rediscovery of classical Roman and Greek art and wisdom (in reality, surviving manuscripts show that writers of the ‘middle ages’ were very well aware of classical Rome and Greece) spread steadily through the nation before then spreading internationally through Europe. This gradual broadening of the idea makes it impossible to give a precise date for the end of the middle ages and the beginning of the renaissance, so a nominal latest date of around 1470 is often given. Much of medieval secular music is a mystery. Most people were illiterate, therefore most music was not written down but passed on and learned by ear and so, of course, we’ve lost it. The music that was written down was most often church music as it was largely clergy who could write. This ecclesiastical music is important in itself, but its predominance in surviving manuscripts gives a partial view of music-making. Medieval music is not immediately accessible for a modern musician. There were different systems of musical notation, none of which indicated precise rhythm until the 12th century. Square notation is now the best known system developed in this period, and once you know square notation some of the music is easy to read. At times, though, it wasn’t written very accurately, or was written with a poor pen and so had vague or indecipherable note values, which is adequate if you know what it’s supposed to sound like, which they did, but we don’t. There are some treasure troves of medieval music. One of the most notable is the Cantigas de Santa María, a book with 420 songs in praise of the Virgin Mary, compiled during the reign of Alfonso X, “The Wise”, 1221-1284, who was King of eight regions in modern day Spain and one in Portugal. During his reign, Alfonso composed, compiled and edited a large number of books, with subjects ranging from art and literature to scientific texts translated into Castillian from the Arabic originals. The melodies of the Cantigas were adapted from sacred sources or popular melodies from both sides of the Pyrenees, including some derived from troubadour songs in Provençal and others that have striking affinities with Arab music. One of the four Cantigas manuscripts, compiled 1257–1283, is beautifully illustrated with pictures of musicians, giving us much information about the instruments of the day, and its music notation is admirably clear. Instruments illustrated in the Cantigas de Santa María, 1257–1283 (click to see larger version). Top row, left to right: unknown; double shawms; harps; pipes and tabors; bagpipes. Bottom row, left to right: simfonies; rebab and oud; bladder pipes; bagpipe; psalteries. The Cantigas were heavily influenced by the lyrics and music of the troubadours, the poets and singers of what is now southern France. From the late 11th century to the end of the 13th century, the troubadours developed several styles of song, most famously the courtly love lyric. Their influence was widespread and considerable, extending well beyond southern France and long after the lifetimes of troubadour writers. Secular medieval music in English is completely unknown to us until the first half of the 13th century, when Mirie it is (Merry it is) was written down, a song complaining about the cold winter weather. It is well to remember when listening to this song how dangerous this season was in the 13th century: inadequate storage of winter provisions meant starvation. Click picture to play video – opens in new window. Mirie it is while sumer ilast, dated to the first half of the 13th century, performed on medieval harp by Ian Pittaway. The now-standard version doesn’t follow what was written in the original sole source, so if you’re familiar with the song from modern recordings, many of the notes, and indeed the opening word, “Mirie”, won’t be what you’re used to hearing. The manuscript clearly indicates the words in this recording, and most of the notes – some are missing and are inserted editorially. To read more about interpretation of this song, click here. This is closely followed by Sumer is icumen in (Summer has come in) from around 1250, another song about the weather, but on a happier note, rejoicing in the sights and sounds of summer: the ewe bleating and the buck farting (honestly, I’m not making this up). Sumer is icumen in is two songs in one, since the text includes a Christian song, Perspice christicola, to the same tune. Click picture to start video – opens in new window. A performance of Sumer is icumen in (Summer has come in), written in c. 1250, around the same time as Mirie it is. Gittern player with dancers, early 15th century. There tended to be two kinds of medieval dance music: either each section started the same and ended differently; or each section ended the same and started differently. This goes for nearly all the medieval dance forms: estampie, rotta, trotto, royal dance, saltarello. Often we find that subsequent sections of a dance grow longer, indicating something about the style of medieval dances. But no dance instructions survive before the 15th century and they are Italian, past the middle ages, well beyond the beginning of the Italian renaissance. Outside Italy, in England, for example, the earliest surviving choreography is in the Gresley manuscript of 1480–1520, found in Ashford, Derbyshire in 1984, so we know little about how medieval dances were performed and little about which instruments they were intended to be played on, so again we have to bring our own artistic and creative sense to bear, interpreting the clues found in iconography and brief scattered references in writing. Click picture to start video – opens in new window. An estampie from the late 13th to mid 14th century English manuscript, Douce 139, played on citole by Ian Pittaway. The music for English, French and Italian estampies has survived, but the dance choreography has not. To read more about this piece, click here. Why does medieval music sound so different to today’s? 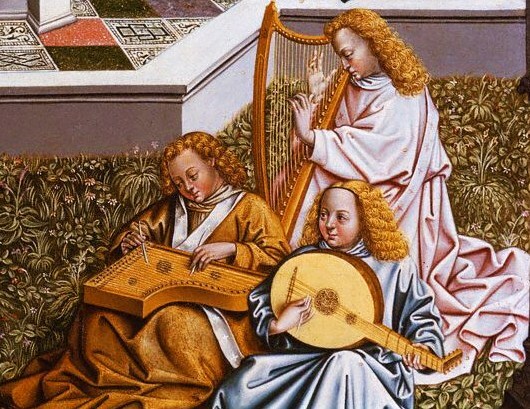 There are several reasons why medieval music has such a distinctive sound which is different to modern music. The instruments were different. Strings were made of gut (sheep’s intestines) or wire (brass, iron, bronze, silver or gold), not steel or nylon as today’s strings tend to be. Many instruments, such as the simfony, citole and the gittern, have no modern equivalents. Even instruments which we still play versions of today – the harp and the recorder, for example, and the modern oboe, which is descended from the shawm – were made to different specifications resulting in a quite different tonal quality. Jan van Eyck (1395-1441), detail from The Fountain of Life showing psaltery, lute and bray harp. The scales or modes were different. Briefly, all modern major and minor scales work to the same musical principles, with identical gaps between the 8 notes of the scale, but pitched differently: so C major and D major sound the same, except that D major starts a tone higher. It is not so with modes. The lack of sharps and flats in medieval music (with some exceptions) means that the relationship between notes for a mode starting on D (dorian) is different to a mode starting on E (phrygian). In addition, each medieval mode has a returning note which plays a key role in the melody, this note known as the tenor, tuba, dominant, repercussa, or reciting note; and each mode has its own characteristic figures or melodic clusters of notes. Add to this the fact that some modes started and ended in the same place, known as authentic modes, and others started on one note and finished on another, known as plagal modes, and we see that the medieval conception of sound was unlike ours. And so the hypolydian mode, which starts on C, isn’t really like modern C major since it is a plagal mode, its finalis or final note being F, and with characteristic melodic figures and a tenor or reciting note of A. The harmonies were different, too. Today ‘harmony’ usually means a single lead melody line with other notes complementing it to form supporting chords. 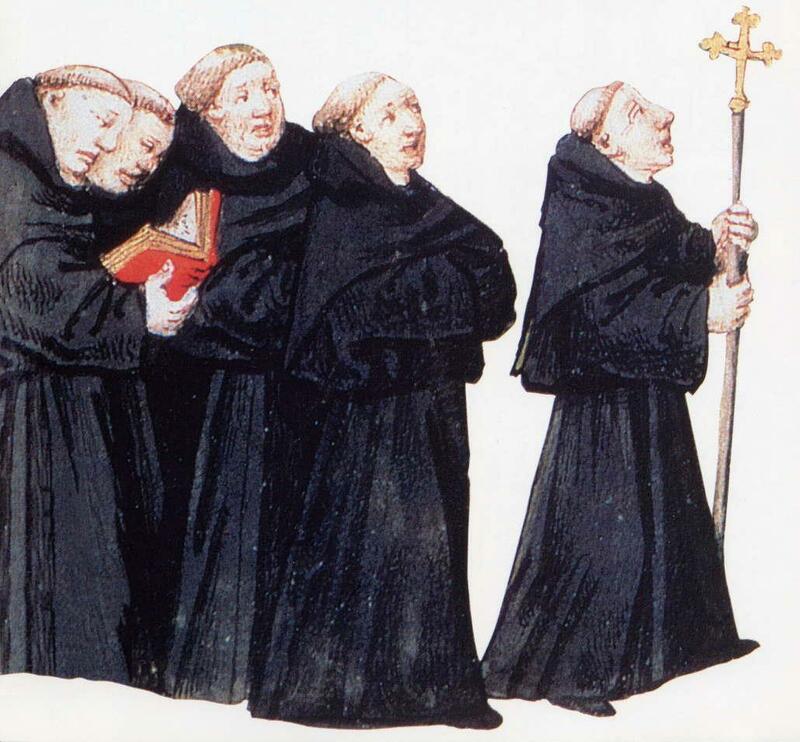 Medieval harmony didn’t work like this, so much so that we should give it a different name: polyphony, meaning many voices, with each voice often having elements of horizontal independence as well as vertical consonance. Medieval music was (i) monophony, a single melody line; or (ii) a melody with a drone; or (iii) organum, which variously meant a melody with a second line that tracks the first with longer notes, or with a parallel octave, fourth or fifth, or two parts in contrary motion, or an additional line with fast-running notes; or, (iv) as with Sumer is icumen in, a melody on top of a ground or ground bass, a short repeating phrase which continues through the whole piece. Don’t let the term ‘ground bass’ give you the wrong idea: this wasn’t ‘a bass part’ in the modern sense of the pitch range soprano, alto, tenor and bass (SATB), but a repeated phrase to ‘ground’ the music. Sumer is icumen in is the earliest surviving example of an English round, where voices sing the same line but start at different times, meaning that no one sings ‘lead’ and each individual’s line is as important as the other. This same principle of all voices being equal applies to an English dance without title in the Harley 978 manuscript, the same source as Sumer, which has two complementary lines of music moving largely in contrary motion, as we hear in the video below. Click picture to play video – opens in new window. This instrumental two part polyphonic piece is from Harley 978, folio 8v-9, England, 1250–1275, and is without title in the manuscript. It is often called a ductia (untexted, phrases of equal length) in modern commentaries, but it may also fit the description of a nota (untexted, a type of ductia, 4 phrases of equal length). Both descriptions are given by Johannes de Grocheio (or Grocheo, or Jean de Grouchy), Parisian music theorist, in his Ars musicae (The art of music), c. 1300. In this performance we hear the “cantus inferior” on gittern accompanied by a rebec drone, the “cantus superior” on rebec accompanied by a gittern drone, then the two parts played together, largely in contrary motion. Until the end of the middle ages, polyphonic parts were pitched close together, their notes sometimes inter-weaving across each other. It wasn’t until the compositions of the English musician John Dunstaple (or Dunstable) in the 15th century that we have voices pitched wide apart, a new practice which was hugely influential and became known in Europe as “the English countenance”, marking the beginning of what was to be a post-medieval, renaissance style of music.